Niche line Bond no. 9 will launch Spring Fling, a new floral fragrance for women, in April. Who knew? Out-of-towners think of Bond No. 9’s beloved home town as all concrete, steel and glass, its streets jammed with skyscrapers and maneuvering Ubers. But come spring, New York defies expectations; suddenly this teeming metropolis is ablaze with flowers throughout the city’s parks, gardens, and even the sidewalk cracks—not to mention the cut-flower bouquets in front of every bodega. So for spring ’18, rather than celebrate a neighborhood, we’re focusing on a concept: the profusion of vibrant florals (irises, bluebells, geraniums, goldenrod, daffodils, to name a smattering) throughout New York City’s green spaces, from the High Line to Central Park, from Bryant Park to Washington Square (all four of which are among the Bond No. 9 eaux de parfum celebrating our city’s parks). 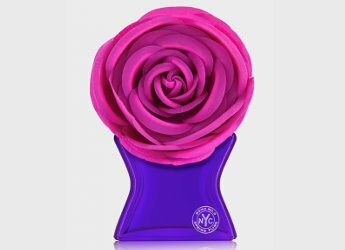 [...] An ultra-feminine sister scent to our classic New York Fling, it’s an up-to-date floral-on-floral bouquet. The starter notes? Lily of the valley and passionflower with a fruity tinge -- The bouquet continues with three notoriously seductive heart notes: rose-like honeysuckle, jasmin and wine-like freesia. All that volatility meets durability in a resonating dry down of contemporary amber, slightly feral musk, and teak recalling a precious antique wooden box. Bond no. 9 Spring Fling will be $375 for 100 ml Eau de Parfum. Love the bottle top! It looks like icing flowers on a cake. Oh how I love to eat those…???? It’s a BIG silk flower. It is mind-blowing how evident it is that the people who make the marketing are clueless about fragrance and just care for visuals, and , well, lets say BS. Honeysuckle is not rosy. Freesia is not winey. Not even going to the fact passionflower is completely odorless.